Reynolds Professor of American Studies Maya Angelou received the Presidential Medal of Freedom from President Barack Obama at the White House on Tuesday. Angelou, a world-renowned poet, author, actress and civil rights activist, joined the Wake Forest faculty in 1982. She was honored along with former President George H.W. Bush, businessman Warren Buffett, artist Jasper Johns and 11 others. The Medal of Freedom is the country’s highest civilian honor. The recipients “reveal the best of who we are and who we aspire to be,” Obama said during the East Room ceremony. Angelou, seated between Buffet and environmental activist John H. Adams, listened as Obama described her life’s journey. Obama bent down and kissed her on the cheek as he presented her medal. “As a girl, Marguerite Ann Johnson endured trauma and abuse that actually led her to stop speaking,” Obama said in his remarks. 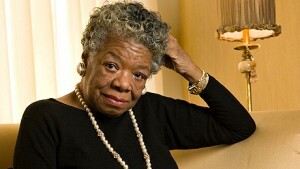 “But as a performer and ultimately a writer, a poet, Maya Angelou found her voice. More campus news at Inside WFU. Angelou first visited Wake Forest in 1971 for a speaking engagement in Wait Chapel, and then returned in 1982 as the first Reynolds Professor. In 2002, the School of Medicine created The Maya Angelou Center for Health Equity to study racial and ethnic disparities in health care and outcomes. She received an honorary degree from Wake Forest in 1977. Angelou is the author of more than 30 books of fiction and poetry, from her best-selling memoir, “I Know Why the Caged Bird Sings,” to her recently published personal cookbook, “Great Food, All Day Long, Cook Splendidly, Eat Smart.” In 1993, she delivered a poem, “On the Pulse of Morning,” at Bill Clinton’s first Inauguration. Former AFL-CIO President John J. Sweeney.